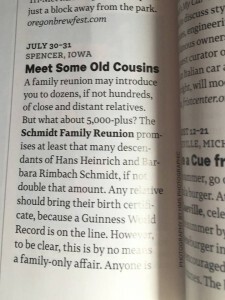 If you’re planning on flying to the Schmidt Family Reunion in Iowa this July 30-31 and you want some good reading, you might want to fly Southwest Airlines. Cousin Carolyn Veller reports that her stepdaughter, Karin Kuehl, flew Southwest Airlines to Orlando yesterday, and what should she find on page 120 of the June 2016 issue of Southwest: The Magazine? Why our humble little (big) family reunion! Pretty unexpected and cool. See the whole page online. Congrats to Katelynn Schmidt & Brian Chou!